Revered as Wapuwoc, the “first light white mountain,” by indigenous Wabanaki peoples and celebrated as a sunrise destination by Acadia visitors today. Invaluable as an aid to navigation for migrating birds and colonial sailors. The focus of development efforts from the earliest days of tourism on Mount Desert Island through the heyday of road construction by Dorr, Rockefeller, and other park founders. Cadillac Mountain is, in so many ways, the heart center of Acadia National Park. So loved, yet so vulnerable. Studies show that 75% of visitors go to the summit of Cadillac at some point during their stay. As a result, in the high season the summit area is often busy with automobiles, buses, bicyclists, and hikers. The Summit Road was closed nine times in 2016 while rangers worked to clear traffic gridlock. The summit’s natural resources have been impacted by millions of feet. Estimates are that 16% of the summit area has experienced soil and vegetation loss and approximately 1.5 miles of social trails have been created as visitors seek ways to spread out on Cadillac. Fragile alpine soils and plant communities, limited parking area and historic roadways, intrinsic limitations on space at the summit, and our deep desire to seek a private spot to experience the mountain’s profound beauty—these realities and others are what make management at the Cadillac Summit so challenging but critical. 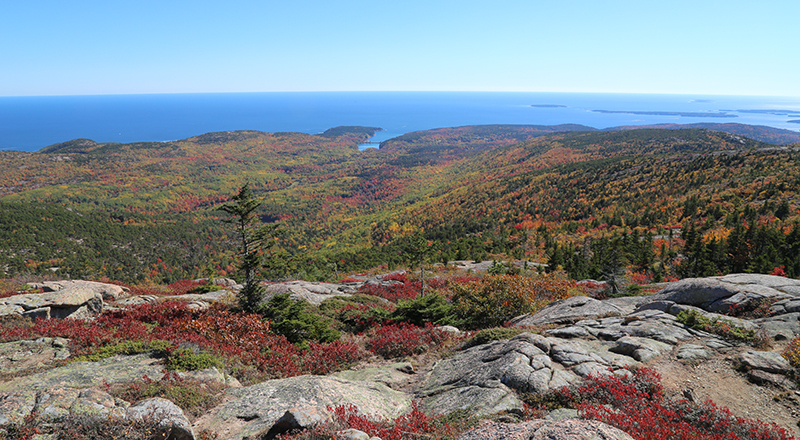 Acadia National Park and Friends of Acadia share a vision for the future of Cadillac that involves fewer vehicles, smaller buses, restoration of fragile alpine vegetation, and improved interpretation of natural and cultural features. 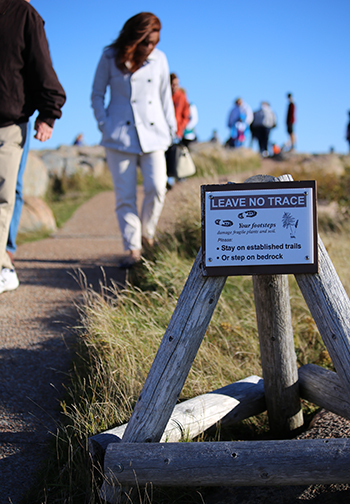 Since 2014, FOA has spearheaded a number of pilot programs and studies focused on the Cadillac Mountain summit, to help park managers address the transportation, natural resource, and visitor experience issues that share the summit as a focal point. Initiated in 2014 with funds from the Friends of Acadia Benefit Auction, the program places a team of roving educator/researchers on the mountain throughout the summer and fall. The Cadillac Summit Stewards spend nearly a thousand hours at the summit each year, answering visitor questions, conducting basic trail maintenance, repairing cairns, removing visitor-built cairns and rock art, responding to emergencies, communicating with park managers, and collecting data about weather, car and bus traffic, visitor usage, and visitor behaviors. As the Cadillac Summit Stewards hike the trails and roved the summit of Cadillac Mountain during their daily patrols, they gather data on visitor behavior, questions, and challenges; and use their observations to develop suggestions on possible improvements for the summit—from additional trash cans and ash trays to new sidewalks, informational signs, and tweaks to parking lot layout. To develop an interconnected set of road, parking, and pedestrian models for the summit, FOA hired a research consultant who collected auto traffic data and trail usage numbers on four trails (Summit Loop, North and South Ridge trails, and Gorge Trail). The models will enable park managers to predict summit conditions such as level of parking, crowding at the interpretive platforms on the loop trail, or number of people off the trails, based on the number of people arriving at the summit by vehicle, bus, or foot. The park will also then be able to use the models, together with previous research, to test a variety of management scenarios for desirable outcomes atop Cadillac. Concurrent with management action to address visitor congestion at the summit, the NPS is working with partners to explore restoration of the mountain’s fragile alpine and sub-alpine plants. 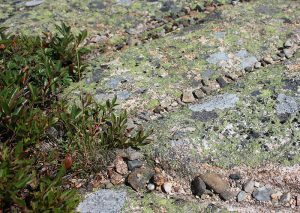 With funding from Friends of Acadia, the New England Wild Flower Society completed vegetation survey work on Cadillac. They surveyed rare plants on the summit, completed a checklist of all vascular plants found on the summit, and walked transects to identify plant communities and changes in vegetation. The information will be used to make recommendations for sites for vegetation restoration on the summit. A new NPS Transportation Plan for Acadia is scheduled to be completed in 2018. With project funding raised through the Second Century Campaign, FOA will be able to help the park with potentially significant costs of implementing the plan’s recommendations, likely to include changes at Cadillac, and may also apply lessons learned at Cadillac to other high-use areas of the park.